I’m not a fan of those who think that everyone else around them always needs to know what is on their mind. People usually can get through their days just fine without a floodgate of other people’s opinions on a host of subjects filling their ears and their social media news feeds. It may be people’s right to speak up, but it is also their right to remain silent. At times, I wish more exercised the latter right. Our country is divided on many social topics about which many millions on both sides of the issues are passionate. That is expected and that is OK. It’s alright for both sides to express their opinion, and each should be able to do so without fear of ridicule and reprisal. We must celebrate the freedom of speech we enjoy in this country – a freedom too many other countries do not offer their citizens. What we must never get to is a point where we cease to tolerate the expression of opposing viewpoints. We must not become intolerant in the name of tolerance. That is hypocrisy. All of our public protests, marches, social media efforts and other forms of pleading our cause may or may not change anyone else’s mind on a subject. It is still up to each individual what he/she believes. Each must choose when to speak and when to remain silent. For my own peace of mind, though, I know that when I have deep-seated feelings and beliefs on a matter, I reach a point where, for my own emotional and physical health, I have to speak up. I encourage you, whatever your position on hot-button issues, to do the same. Speak your mind for peace of mind, and allow others the freedom to do the same. Earlier this week I shared a book review of Seth Godin’s Tribes: We Need You to Lead Us as well as another post inspired by the book about leading from the bottom. Today’s post has its genesis in one sentence found in the book where Godin lists his principles related to creating a movement. His final principle is “Tearing others down is never as helpful to a movement as building your followers up” (p. 105). That may seem obvious, but I’m sure it’s included because people often violate the principle. How can we expect others to join us in accomplishing some task, making a change, joining a cause to make a difference, or simply doing our day-to-day work if we’re criticizing or complaining along the way? Don’t we respond better in attitude and in performance when others are quick to praise and encourage rather than to tear us down? Of course we do! This principle reminds me of a few other maxims that are (or should be) a part of our language. One is “You attract more flies with honey than with vinegar.” This one is literally true when it comes to attracting me as well. I love honey and consume some almost daily. Vinegar? I run from the stuff; can’t stand to smell it or be in the same room with it. Building others up is honey. Tearing them down is vinegar. Be honey. Perhaps one of my favorite sayings related to this thought comes from a bumper sticker I saw last year: “Wag more, bark less.” A Google search on the phrase will yield many results, including more paraphernalia with the saying on it than you can afford to purchase. As a dog lover and one who believes in being encouraging to others, this one sums up the notion quite well for me. Take a moment to review in your mind the conversations you’ve had in the past 24 hours. In those talks, were you figuratively more often wagging your tail or barking at the listener? Were you building up or tearing down? You may not have noticed at the time, but chances are good that the other person did. As you think back on the conversations you had with coworkers this past week, with people you manage, with those living under your roof, or with others you spoke with along the way, did you do more wagging or barking? If I approach a dog, I’m going to notice if he’s wagging or barking and it’s going to impact how I respond. Same is true for people. As you go about your conversations today, make it a point to wag more and bark less. It will do as much good for you as it does for those around you. How many times have you been in a conversation with others and wanted to bring up some obvious topic, but failed to do so? How many times have you sat in meetings, heard proposals, watched presentations, discussed important matters, or been embarrassed on behalf of someone else, all the while dying to say what is really on your mind, but never mustering the courage to say it? 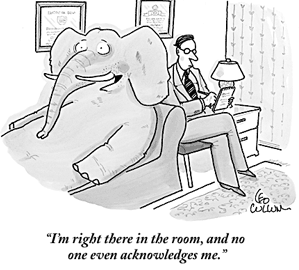 Why do we hold back and so often fail to acknowledge the elephant in the room? In the case of meetings at work, perhaps you can’t bring yourself to openly disagree with someone higher up the org chart. Maybe you are the kind of person who avoids conflict at all cost, both in personal and professional settings. Maybe you fear the known or unknown consequences of being that person to bring up what you and probably many others wish someone would address. If you don’t acknowledge obvious issues, it is very possible that the consequences of failing to address them will be worse than doing so. For example, if you have relationship issues with someone, but try to keep the peace instead of putting matters on the table, aren’t the potential emotional and physical consequences of holding it all inside worse than the temporary awkwardness and unpleasantness of the dreaded conversation? If you are being pitched a plan of action by a manager or someone higher up than you in an organization, and you know that the suggested path has major flaws, aren’t you complicit in failed and potentially harmful business decisions if you do not raise the concerns you have? If others are trying to get you to go down some path that could be dangerous or have serious negative consequences personally and/or professionally, don’t you have the responsibility to listen to your intuition and interject a cautionary word into the conversation? If someone’s dress, hygiene, personal habits or behavior are the subject of much discussion behind his/her back, isn’t the decent thing to do to have that needed and difficult private conversation in order to help the other person? When it comes to acknowledging elephants in the room, few seem willing to be the one to step up and do so. Oh, how we need more people willing to take that step! Doing this doesn’t mean you have to do so in an unkind, harsh, abrasive, offensive way. Besides, you won’t likely succeed in promoting positive change with that approach, anyway. Instead, with a genuine heart of compassion, caring, and concern for what is wrong or what might fail, you have an incredible opportunity to change the path of a person, group, or entire company from darkness to light, from failure to success. Those on the hearing end are usually able to sense genuine concern; they will most likely be able to see the intentions of your heart and hear your message, even if it is one that is difficult for them to hear. Nobody benefits from having a bunch of “yes” men around. While I’ll never be in a position of corporate power by virtue of the position held, if I ever was, I would hope to be fortunate enough to surround myself with men and women who always speak the truth, even when it is hard for them to deliver the message and perhaps harder for me to hear. If it is my thoughts, plans, attitude, behavior or anything else that is ever the elephant in the room, then I desperately need and want someone to tell me that. Do it gently and kindly and (if possible) privately, but by all means, do it! I’m a big boy. I can handle it. I have no idea what life situations you are in where you feel you need to bring up something “obvious” that nobody else is saying, but I suspect you can think of one or two such situations at this time. I strongly encourage you, in the interest of doing what is most helpful and kind and beneficial in the long run, acknowledge with whomever else needs to hear that there is an elephant in the room. The benefit gained from the honest conversation will far outweigh the temporary fear of negative consequences that has held you back so far.